Lesotho's Prime Minister Thomas Thabane addresses the 72nd United Nations General Assembly at U.N. headquarters in New York, Sept. 22, 2017. Lesotho’s new prime minister, Thomas Thabane, told VOA that his government will focus on ending hunger and reducing crime, especially against women. He also said the country’s political space is open to all, though he made clear he wouldn’t tolerate those who, in his words, “go outside the rules.” Thabane spoke with VOA this week on the sidelines of the United Nations General Assembly. Thabane, who took office in June, also brushed off criticism that his government is trying to silence the opposition and critical journalists. Opposition politicians say they feel threatened after the government arrested one lawmaker last month and recently arrested a journalist and closed down his radio station. The government told VOA the arrested lawmaker was a person of interest in a murder case. The prime minister said his government is working with broadcasters to expand their reach through the national grid. He didn’t specify how the station that was closed might have broken laws. FILE - Locals arrive to cast their vote during the national elections at Semonkong, Lesotho, June 3, 2017. The months since Thabane was elected have been rocky. Shortly before he took office in June, his estranged wife, Lipolelo Thabane, was shot dead. No one has yet been arrested in that crime. Early this month, the head of the army, Lt. General Khoantle Motsomotso, was killed by military rivals. The slaying raised fears of a new attempt at a military intervention in the government — the army ousted Thabane in 2014, two years after he was first elected prime minister. He said there was “senselessness” in the country and that the only way to resolve problems was to talk them out openly. 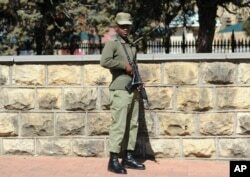 FILE - A soldier stands outside the military headquarters in Maseru, Lesotho, Aug. 31, 2014. Prime Minister Thomas Thabane said there had been an attempt to take over Lesotho, a country of about 2 million people that is surrounded by South Africa. One of his goals is to reform the army, which has ousted previous elected leaders and has what some consider to be an outsized role in the government. The country needs to assess whether it needs a traditional army, he said. And if it decides it needs an army, Thabane said he wants the military to reform its training manuals and recruitment. As prime minister, his priorities include reducing hunger, educating all children and stopping violent crime, particularly against women. He wants to work with landowners to make sure fallow land can be planted with crops. He also hopes to mend what he called Lesotho’s reputation as the “bad boy” of southern Africa. Political stability will help, as will improving the relationship with neighboring South Africa, Thabane said. That relationship has been neglected, he said, and it was Lesotho’s fault. One step to mend the relationship will be to join efforts to stop cross-border crime, including stealing livestock, Thabane said.